We present finest grade of Automotive Parts that are offered by us at the most competitive prices. Besides, we fabricate these parts using optimum raw material in accordance with the set industry standards. These parts are also available in different grades and sizes and suit the diverse requirements of the clients. 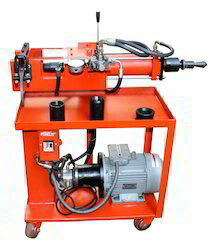 Portable hydraulic swager/expander is specially designed to form ball joints, slip joints, flares and flanges and perform doming and reducing anywhere at sight. Our firm offers a high-quality range of Faucet Reseater Kit. It is manufactured using top quality materials and latest technology and tested under various quality parameters.